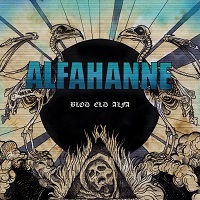 The opening track on this record, "Alfa Kropp Alfa Blod", is built around strong, atmospheric Rock music with chanted, almost sing-along vocals. This doesn't fit soundly into any specific pigeon hole within the Extreme Metal spectrum. There's some vocal lines that wouldn't sound out of place in a Black Metal track, and some guitar lines that most Rock bands would love to call their own. Right off the bat, it's extremely clear that this is something quite different from "just another" Rock or Metal release. "Besatt" is another great piece of dark Rock music with incredibly catchy guitar lines and powerful vocals. In particular, there are plenty of dissonant riffs that really make this track great. "Skallerormsgift" has a lot more Black Metal elements in it, but with a really cool Rock edge underpinning it all. Erlend Hjelvind, of KVELERTAK fame, provides some really excellent vocals on this track, which really work well with the music and ultimately compliment Pehr's vocals, which have a much harsher, traditional Black Metal rasp to them. "Vand Inte Ryggen Till" has a lot of really good, powerful Hard Rock riffs, cloaked in a thin layer of atmospherics and with a slight Black Metal edge to it. "Blodad Tand" is another great track with some interesting, eerie guitar lines and catchy vocals. The Black Metal influences in the bands sound really come to the fore in this track, and it marks the point where the album really starts to build momentum and draw the listener in. "Hora (Tils Du Dor/Huora Kuolemaansa)", featuring another guest vocalist, this time Spellgoth from HELHEIM, is easily one of the stand out tracks on the record. The balance between the Black Metal and the Hard Rock on this particular offering is at just the right mix, which results in an amazing track with a great interchange between the two vocal styles, and some great guitar lines that stick in your head after a single listen. "Arkelogen" is a great Black 'N' Roll tune, characterised by well thought out guitar parts and a noticeable atmospheric quality to it that makes it all the more appealing. "Beserk", the penultimate track, has some really solid, authoritative guitar playing on it, and some equally powerful drumming that collectively drive the track. The vocals are more varied on here than on some of the other tracks on the album, which makes it even better than it already is. If I have one criticism of this song, it's that it is too short. The final track on the album, and the third to feature a guest vocalist, is "Slutdestination Eskilstuna", a very cool track that features the unmistakable vocals of SHINING's Niklas Kvarforth. His vocals complement Pehr's perfectly, and all round, this seems like the perfect collaboration. The music is much darker than it is throughout most of the record, and the lyrics are delivered with more passion than the vast majority of the preceding songs. It's a really great way to finish this record. If nothing else, this album is very, very interesting. The music is great on all fronts, and I can honestly say that, although I've heard Black Metal and Hard Rock being combined before, this is unique. Normally the Black Metal influences of a band are dominant in the song writing, not vice versa. It's a solid record, with lots of cool ideas and experimentation that works extremely well. I'd highly recommend checking this out if you want to hear some genuinely different, idiosyncratic Extreme Metal.